Never before have so many companies won permission to search for oil and gas on the Norwegian continental shelf as they did this week, while discussion flies over whether Norway should construct a new pipeline from fields in the Barents Sea. Environmentalists dislike all the oil and gas activity and as always, Norway’s own Statoil is playing a decisive role. Oil & Energy Minister Ola Borten Moe formally offered shares in 60 production licenses to 42 companies on Tuesday, and 27 of them won operating rights. He said it was the largest concession round ever, in terms of the number of companies involved and the number of production licenses offered. The round, known as TFO in Norwegian (for tildeling in forhåndsdefinerte områder, or Awards in Predefined Areas, APA 2011), involves exploration and production in what are called the “mature” areas of the Norwegian Continental Shelf (NCS). That’s where the geology is known and infrastructure already in place. Environmental organizations criticized the large number of licenses offered, saying that all the drilling and prospects for increased production threatens the coast. “When we know that emissions must decline and there are more new oil discoveries, it’s crazy to let Norway’s biggest polluter get access to even more oil and gas,” claimed Lars Haltbrekken, leader of Naturvernforbundet, Norway’s chapter of Friends of the Earth. He was especially critically that the Nordland V field, south of Lofoten, Vesterålen and Senja, will now be opened to oil activity. All told, the licenses were widely spread from the far north to the south, with four granted in the Barents Sea, 22 in the Norwegian Sea and 34 in the North Sea. 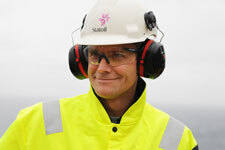 Statoil was awarded eight of the licenses, but other winners included a wide range of foreign firms along with Norwegian. The growth in oil exploration and production comes after major new oil discoveries off Norway and at a time of still-high oil prices. Moe said at an oil seminar in Sandefjord that interest in the seas off Norway hasn’t been so high since 2005. Meanwhile, another high-cost project is under discussion, a proposed pipeline from oil fields in the Barents south to the pipeline network in the Norwegian Sea. It’s expected to cost as much as NOK 20 billion and newspaper Dagens Næringsliv (DN) has reported that Gassco, which operates Norway’s transport system for gas, is positive towards extending the existing network. “Norway must take responsibility for stable gas supplies to Europe,” Johan Petter Barlindhaug, a professor and owner in North Energy, told DN. Both Moe and Foreign Minister Jonas Gahr Støre have also spoken positively about extending a pipeline to the Barents, but others are skeptical. Arvid Jensen of the suppliers’ group PetroArctic, is critical until it’s assured that there’s enough gas resources in the Barents to justify pipeline construction. The alternative is a new plant for LNG (liquified natural gas) which can be shipped to customers around the world. Shipowners would likely prefer the latter.